Dinner that will please everyone! Introducing our new favorite side dish. Dinner is served! 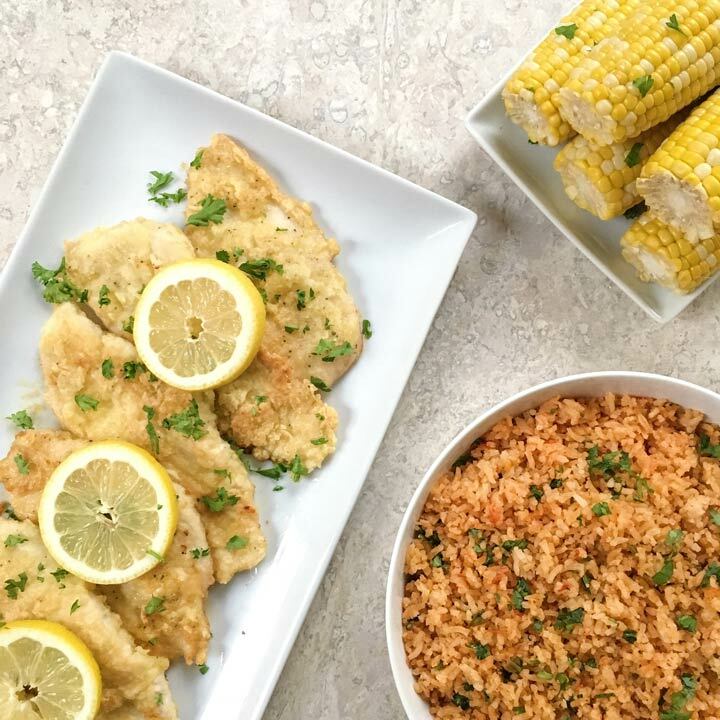 Chicken Piccata, the best vegan Mexican Rice, and corn. All requests of my husband and son tonight, and they loved it! It was our first time making Mexican rice and it is definitely a new favorite, savory side dish. Recipe from America’s Test Kitchen, it’s made with tomatoes, onions, jalepanos, garlic and veggie broth, it was the perfect consistency and had a yummy, balanced flavor. NOTE: While the original recipe does not call for egg, sometimes we will dredge the chicken in egg, then flour. It's personal preference. If chicken is not thin, place between wax paper and pound lightly with a large heavy spoon to flatten. Blend flour, salt and pepper in a shallow bowl. If using egg, whisk egg in a second shallow bowl. Set up your workstation with the bowl of egg, flour, and a empty shallow bowl or plate. Dip the chicken into the egg (if using), gently shake off the excess, then dip chicken in flour mixture to coat lightly. Set on empty plate. Heat oil in a large skillet or fry pan, and when it is very hot, not brown, place the chicken in one layer in the pan. Cook on medium heat until golden brown, then turn & cook the other side. Approx 2-4 minutes each side. Carefully pour off excess oil from pan, holding back the chicken. Add the wine to the saute pan. Cook 1-2 minutes, flipping the chicken once, until the wine evaporates. Add the lemon juice and cook an additional 2 minutes, flipping the chicken once in the thin sauce. Remove chicken and thin sauce from pan and garnish with parsley and lemon.